OAK RIDGE, Tenn. – November 13, 2018–The U.S. Department of Energy’s (DOE) Exascale Computing Project (ECP) announced it has been recognized by HPCwire with an Editor’s Choice Award for the project’s extensive collaborative engagement with government, academia and industry in support of the ECP’s effort to accelerate delivery of a capable exascale computing ecosystem, as the nation prepares for the next era of supercomputers capable of a quintillion operations per second. The award was presented at the 2018 International Conference for High Performance Computing, Networking, Storage, and Analysis (SC18) in Dallas. 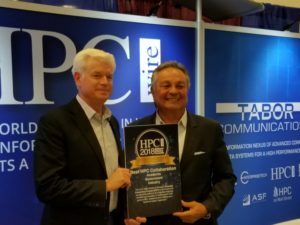 The annual HPCwire Readers’ and Editors’ Choice Awards are determined through a nomination and voting process within the global HPC community, as well as by selections from the HPCwire editors. The ECP was launched in 2016 as a collaboration between two DOE organizations, the Office of Science and the National Nuclear Security Administration. The ECP leadership team includes experts from six DOE core national laboratories—Argonne, Lawrence Berkeley, Lawrence Livermore, Los Alamos, Oak Ridge and Sandia. As part of its far-reaching collaborative efforts, in 2017 the ECP announced the formation of the ECP Industry Council, an external advisory group of executives from some of the nation’s most prominent companies with a vested interest in bringing the potential of exascale computing to a wide range of industry segments. The ECP’s Industry Council is chartered with providing guidance and feedback on the project’s strategic direction, project scope, technical requirements and progress, bringing the perspective of private industry to the emerging need for exascale-level computation and the formation of a capable exascale computing ecosystem. Exascale is the next level of performance for HPC. Today’s petascale systems are measured in quadrillions (1015) of operations per second. Exascale systems will run at quintillion (1018) operations per second, and the ECP is developing applications that will more realistically simulate the processes involved in energy production, transmission and storage; precision medicine; manufacturing; quantum materials; chemical catalysts; the earth system; and the nation’s nuclear stockpile stewardship program, as well as the unseen physics at work within the fundamental forces of the universe, among other applications. The ECP is also investigating the tremendous potential exascale computing holds for emerging disciplines, such as large-scale data analytics, machine learning and artificial intelligence. The U.S. Department of Energy’s Exascale Computing Project’s mission is to ensure all the necessary pieces are in place for the nation’s first exascale systems. The project is delivering an ecosystem that includes mission critical applications, an integrated software stack, and is working closely with U.S. high performance computing hardware companies to identify and drive the development of advanced computer system engineering and hardware components. All three of these elements are necessary to enable fully functional, capable exascale computing environments, which are critical to national security, scientific discovery, and a strong U.S. economy. The ECP is a collaborative project of two U.S. Department of Energy organizations, the Office of Science and the National Nuclear Security Administration.